Large on style and multimedia power, yet takes up little space. Leather texture revives your sense and warms your heart. P2-P5945GC, with the elegant and slim design, enriches your life by providing rich features for multimedia applications. solution for your cluttered desk and a work of art for your home. Combining mechanism and MB design, P2-P5945GC is only 8.9L with powerful performance and all the necessary functions you need. Its creative slim design is a perfect space-saving solution for cluttered desks. The highly integration of mechanism and MB design creates the best placement and air flow. Besides that, ASUS unique Q-Fan Technology can detect the CPU lording and temperature automatically. 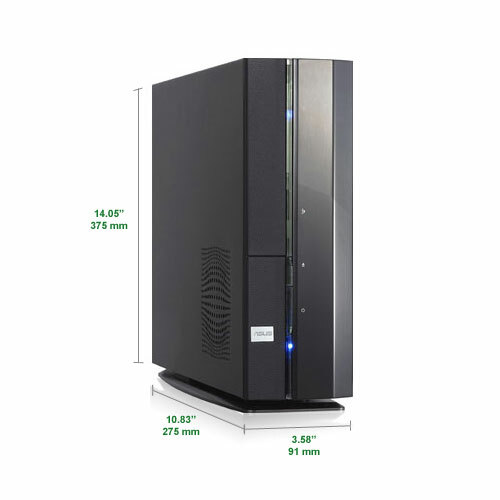 By these two ways, P2-P5945GC provides the best thermal & acoustic solution and quiet working environment. The P2-P5945GC enriches your life by providing rich features for multimedia applications. It includes D-sub, DVI-D, S/PDIF out, 8-channel HD audio, CF, MS, MS Pro, SD, MMC card readers, and etc. It provides users a convenient platform to connect peripherals in daily life. ASUS Recover Pro can back-up users' data just in few seconds and recover it in few minutes. Recover Pro is an always available recovery tool. It stores user data, applications and the operating system in the host-protected area of the hard drive. Users can easily recover system to the original factory conditions or to a more recent state without restore CDs. No need to worry about losing data due to virus attacks. 3.58" x 14.05" x 10.83"